***You can purchase an INEXPENSIVE AD-FREE PDF of this pattern on Etsy HERE and on LoveCrochet HERE! This beautifully formatted PDF includes the step-by-step pictures and is a total of 7 pages including the cover page! It is imperative that you follow along with my step-by-step blog post HERE to see more detailed photos and to read the story behind these dogs! We crocheted two dogs: one with pointy ears and a smaller snout, and one with floppy ears and a larger snout. Position eyes to head but do not secure them yet. 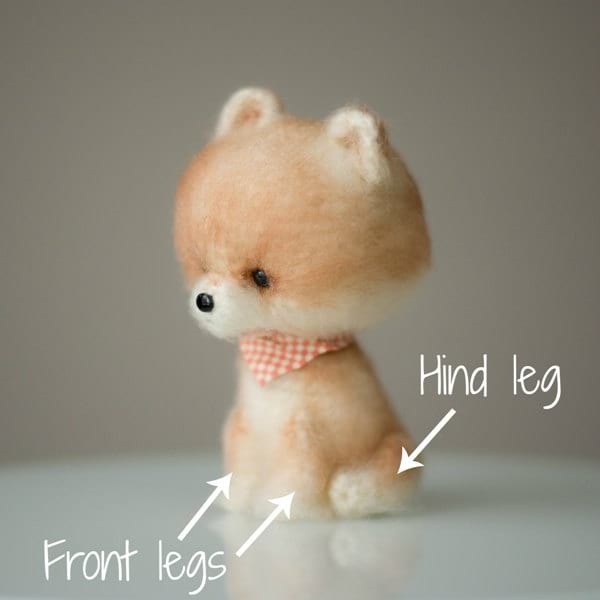 Attach snout (after adding nose and mouth to snout) to head. We did not use the washer backing to secure the nose as it would have widened the snout. We secured the oval safety eye with hot glue. ***Attach snout as CLOSE to the eyes as possible for a cute puppy look. After snout has been attached, secure safety eyes into place with washer backings. Fill with fiberfill and close up the bottom of the head. Brush out bottom of the head. 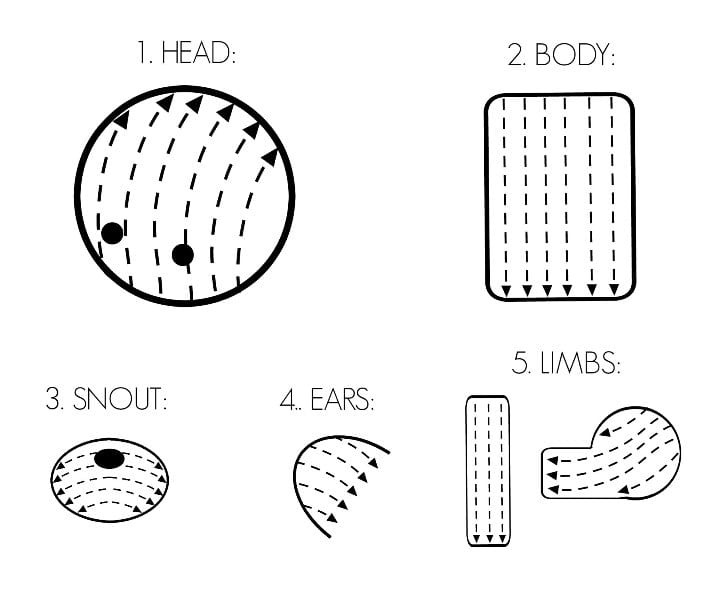 Fill body with fiberfill and attach to bottom of head. Attach both front limbs (do not stuff with fiberfill) to front of body. Position front limbs just below the protrusion of the belly. Make bandana or collar and wrap around neck. Secure with hot glue gun. Fasten off and leave long end for sewing. Agitate/fuzz up yarn using dog slicker brush. Attach oval safety eye (serves as nose) and embroider small smile underneath nose with embroidery floss. Secure oval safety eye with hot glue rather than plastic backing to prevent snout from protruding outwards too much. Agitate/fuzz up yarn using dog slicker brush. Add colour with Sharpie marker. Fasten off. Move initial end up towards the final end by weaving through the stitches (later on, use both ends to attach ears to head). Agitate/fuzz up yarn using dog slicker brush. Determine position of safety eyes approximately between Rounds 14 and 15 about 5 stitches apart (do not fasten into place but insert eye to make a hole). Remove eye and use crochet hook to widen hole to indicate location. Add Sharpie marker colour to the area near the eye: first add lighter brown colour, brush it out, and then add darker brown colour for greater depth. Once you are happy with the colour near the eye area, place safety eyes back into holes but do not secure them yet (wait till the snout has been attached before snapping into place). Position snout underneath as close to the eyes as possible and attach to head. Attach ears to side of head. Stuff head. R6: In back loops only, Sc 24. We will now begin shaping the belly and bottom of the body. Agitate/fuzz up yarn using dog slicker brush. Add colour to desired areas. Attach body to bottom of head. R1: 4 sc in Magic Ring. Agitate/fuzz up yarn using dog slicker brush. Add colour if desired. Attach to front of body. Agitate/fuzz up yarn using dog slicker brush. Add colour if desired. Attach to back of body. Agitate/fuzz up yarn using dog slicker brush. Add colour if desired. Attach to bottom back of body. Cut patterned fabric using below dimensions (leave 0.5 cm seam allowance). For dog collar, wrap around neck and glue into place. 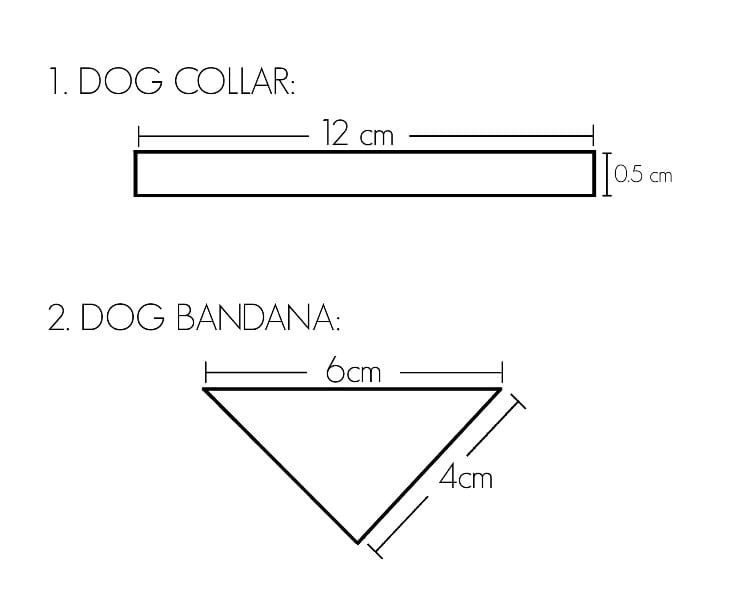 For dog bandana, cut both dog collar and triangle pieces. Fold top of triangle piece over dog collar and sew into place. Scrunch front of fabric to achieve creased effect and secure with hot glue. 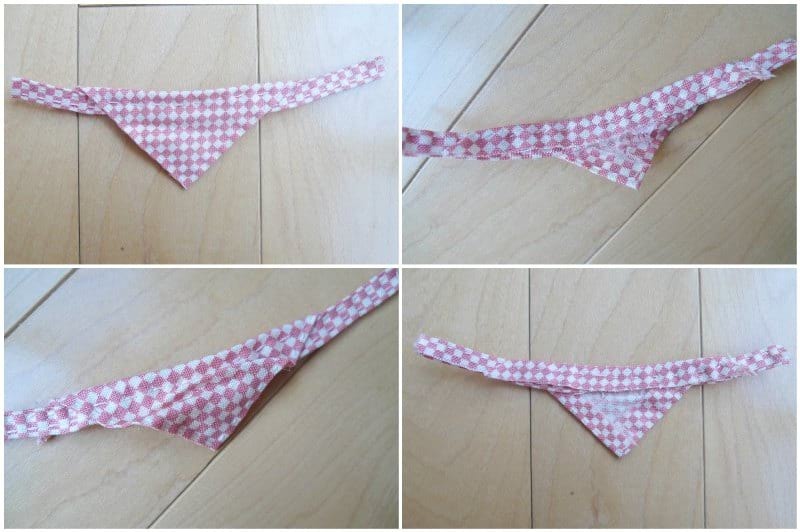 Wrap bandana around dog’s neck and glue into place. 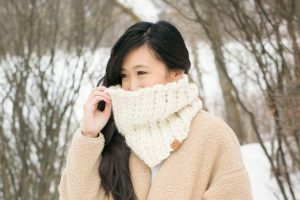 This pattern is an original pattern by Stephanie Lau of All About Ami (February 2018). Please do not claim this pattern as your own. If you wish to share this pattern, you may link to this pattern but please do not reprint it on your site. You may keep a copy for your own personal use but please DO NOT sell the pattern or distribute it.